We tend to think that email should drive traffic back to our website. While that’s true in a lot of cases, why not send some traffic to our best social content? Especially if it helps us get more viral reach. In today’s digital world, if you want to stay top-of-mind, people need to see you…a lot! Ideally, you’ll have multiple channels through which your audience can connect with your brand. Email and social media can be two of those channels. Your branding needs to be consistent between the two, but your tone can be slightly different. Promote your social media accounts in your email newsletter, especially if fun, interesting and exclusive content can be found over there. 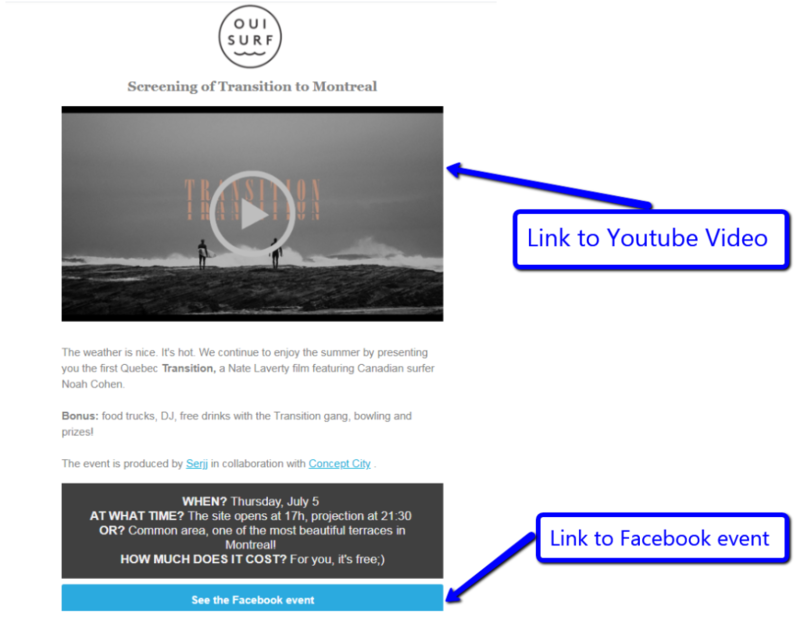 You can also do the opposite and share a teaser of your newsletter’s content on social media and entice followers to become email subscribers. Did you know that you could upload your list of email subscribers to Facebook Ads Manager and create a ​custom audience​? When you do that, Facebook will find the profiles of your email subscribers, and you can then use that audience as a target for an ad campaign. This means that you can retarget your email subscribers on Facebook pretty easily. By the way, you can do the exact same thing in ​Google Ads​. At Cyberimpact, we use that feature to retarget our users with educational and inspirational Youtube videos. But that’s not all. Once you’ve created your audience of email subscribers, you can ask Facebook (or Google) to create a similar audience. Their super powerful algorithm will analyze your subscribers and will automatically create an audience of people who have similar demographics, interests, etc. You can then advertise to this new highly targeted group of prospects. These similar audiences on Facebook and Google Ads have been some of my better performing audiences for generating new Cyberimpact users. We all know that Facebook Pages’ organic reach is down, way down. But groups can be a great opportunity for your brand. It’s one of the ways Sprout suggests to outsmart the Facebook algorithm​. Like we said before, your email subscribers are probably some of your best and most loyal fans. Many of them are probably also customers. So it makes sense to ask them to join your exclusive Facebook group. A Facebook group can be the perfect place for you to share useful content with your users and/or subscribers. Members can also ask questions, interact and help each other, which creates a sense of community and belonging. If an exclusive group makes sense for your brand, test it and see if it can lead to more engagement than what your page gets. 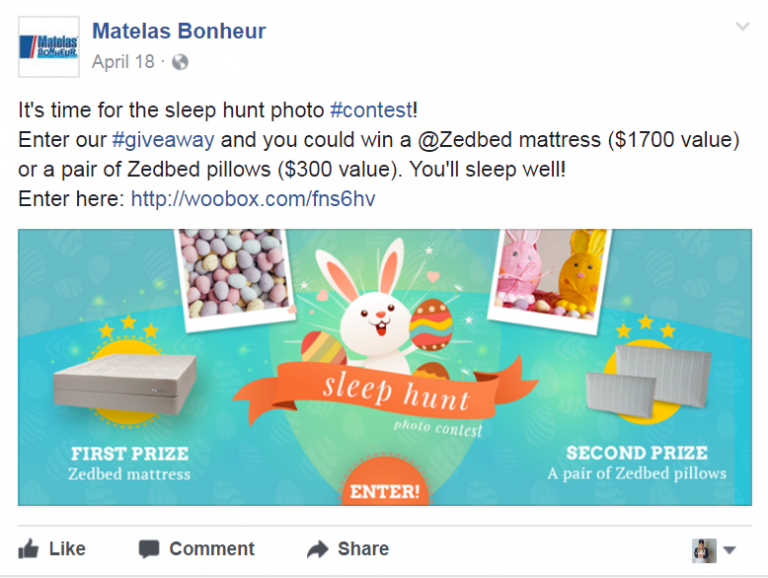 When entering the contest, participants have to provide an email address and are asked if they want to join Matelas Bonheur’s email newsletter. A lot of people agree, and that’s how we build our email list. Also, participants are asked to share the contest on social media and when one of their friends also participate, it increases their chances of winning. That’s how we get social media reach and engagement. Similarly to what we talked about at the beginning of this article, you can (and should) kick-start the contest by inviting your existing email subscribers to participate. They will share with their friends on social media and this will lead to both new email subscribers and a boost in social reach. These viral contests create a loop in which email and social work together and feed off each other. So these are just a few ways that email and social can work together to maximize your brand’s reach and engagement. Hopefully, they inspire you to test out new strategies. Can you think of other ways to use email to amplify your social media strategy? Antoine Bonicalzi: Antoine Bonicalzi has been involved in digital marketing since 2009. Occupying key roles in several agencies, he has helped hundreds of small businesses and organizations succeed with digital marketing. Today, as the Marketing Director for Cyberimpact​, a Canadian email marketing and marketing automation platform, Antoine has the responsibility of growing its user base across the country. His role involves communicating the secrets of email marketing and marketing automation to Canadian businesses and organizations through articles, training workshops and seminars.